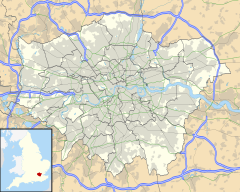 The most easterly district of Upper Norwood is now also known as Crystal Palace and is the commercial hub of Upper Norwood known locally as the "Triangle". The most westerly district is also known as Crown Point. The central district was once known as Norwood New Town, but this name is now only seen on older maps. A notable park in the area is Upper Norwood Recreation Ground. Its 19-acre (77,000 m2) site is part of the Harold Road Conservation Area. Its boundary is defined by Chevening Road, Hermitage Road, Eversley Road and Harold Road. One of London's hidden rivers, River Effra flows under the park and at the Harold Road end a wellhead exists. It was covered in the 1940s. The Upper Norwood Recreation Ground was a location in Patrick Keiller's 1983 film, Norwood, and in Chris Shepherd's 2010 film Bad Night for the Blues.